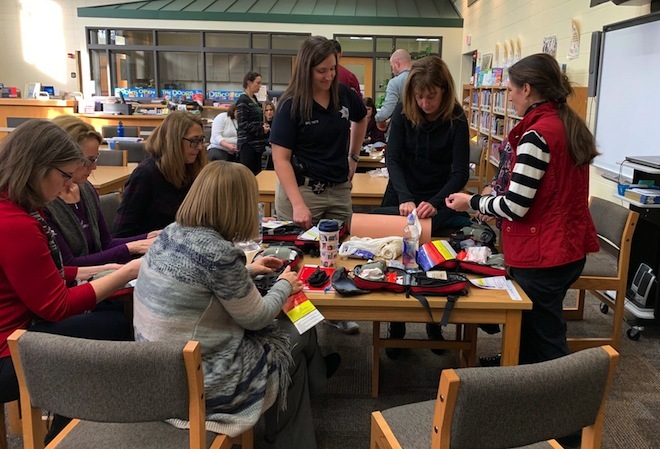 Eastview Elementary School teachers receive instruction on their Treat and Go Kits from Lake Geneva Police Officer Kaitlin Tietz at a recent training for the Treat and Go Trauma kits. The kits will be in all the Lake Geneva schools. New school safety measures are being put in place in the Lake Geneva schools. Treat and Go Trauma kits will be in all classrooms and common areas. Six additional automated external defibrillators will be installed at Badger High School and one in the District Administration Center. The trauma kits include tourniquets, hemostatic gauze, wraps, bandages and chest seals. The kits were paid for with grant funding from the Department of Justice Safety Grant received earlier this school year. Through a joint effort between the districts, local law enforcement and emergency protection services, training has been provided to all teachers and staff at Lake Geneva Middle School and Eastview Elementary School with other school trainings coming soon. Ongoing training will be maintained at no cost to the district. “This law enforcement agency recognizes the incredible necessity of partnership, consultation, and cooperation to protect the safety of our community,” Lake Geneva Police Chief Michael Rasmussen said. “The Lake Geneva Fire Department is thankful that our schools have been awarded a grant to enable them to provide lifesaving equipment which will be readily accessible in emergencies,” Lake Geneva Fire Chief John Peters said. Keeping communication open with first responders and working together to prevent emergencies as well as responding to them is a key component to providing safe schools. “We are fortunate to have an excellent working relationship with our local first responders,” Gottinger said. “We honor our strong partnership with the schools and police department, sharing a common commitment to ensure the safety of children in our community. While we all hope such incidents will not occur, we stand vigilant to respond as quickly and competently as possible whenever help is needed,” Peters said. Two recent, lifesaving deployments of the AEDs at Badger High School prompted the purchase of the additional AED units for Badger and the District Administration Center. Both uses of the AEDs were for afterschool activities and not for students and both victims were saved by bystanders who used AEDs in the building. The new units will have the advantage of being able to download vital information to EMTs and cardiologists who treat the patient. The AEDs at Badger will be put in high traffic areas including the main gym, commons, sports center, fitness center and main office, increasing the number of AEDs at the high school to 10.